Built at A/B Finnboda Varf, Stockholm in December 1920 by A/B Svea. Sold in 1967, renamed 'Santa Katerina' Two years later she became the 'Efktimon'. She was broken up in 1972. Hansa B type vessel built at Naksov SV Denmark. Launched 04.04.1946, completed 05.1947. Purchased 1970, renamed 'Messala'. Sold 1978 for further trading. Builder De Merwede, Hardinxveld, Holland. Launched 12.05.1949, completed 20.09.1949. Purchased 1974, sold for demolition 1980. Broken up at Castellon by Industrial y Commercial de Levante. Built at Nordseewerke, Emden Germany. Launch date 25.03.1953. Date of completion 6.1953. Sold for demolition to Chien Yung Enterprise Co, broken up at Kaohsiung 01.08.1979. LOA 123.6m, Beam 16.8m, DWT 6,158. 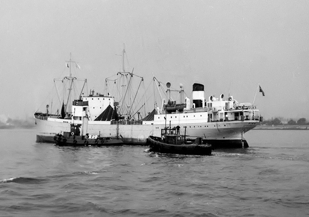 Built in 1948 as "Citos" by Rederi A/B Sirius at Blyth DD, Cowpen Quay yard, in United Kingdom. Launched 08.06.1948. Date of completion 19.10.1948. 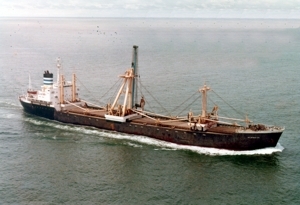 Purchased in 1974 as 'Arsenal' from Greek shipowner Pateras Brothers Ltd and renamed 'Ardenal'. Sold in 1978 to Greek interests. LOA 132.9m, Beam 17.1m, DWT 7,575, Flag Greece, Class Bureau Veritas. Built at Readhead, South Shields, United Kingdom by Irish Shipping Ltd. Launched 09.08.1948. Completed 18.12.1948. 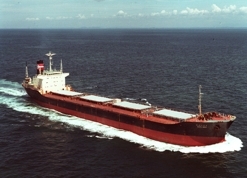 Purchased enbloc with sister M/V 'Alkyon' from Greek shipowner Fafalios Shipping SA who still has vessels named 'Amazon' and 'Alkyon'. 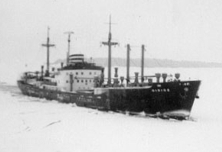 This was the first ship ever to complete five round-trips in a season between the Canadian Lake Ports and Europe with Canadian grain. 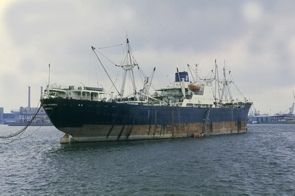 She was broken up by Taiwan Ship Scrap Co. Ltd of Kaohsiung, China on 22.05.1979. LOA 132.9m, Beam 17.1m, DWT 7,575, Flag Greece, Class Bureau Veritas. Built at Readhead, South Shields, United Kingdom by Irish Shipping Ltd. Launched 14.01.1949. Completed 06.07.1949. Resold to Pro-Verde Shipping Company SA. LPP 154.7m, Beam 20.1m, DWT 15,390. Built at Bartram South Dock, Great Britain. Launched 15.10.1958, completed 03.1959. Purchased from Greek shipowner DiamLemos Shipping Corp. Broken up at Gadani beach 04.12.1982. LOA 142.5m, Beam 18.6m, DWT 12,620, Flag Greece, Class Bureau Veritas. Built in 1956 at Uddevallavarvet yard in Sweden. Launched 21.04.1956. Purchased class condemned in July 1978 with 200% financing. Rebuilt at Stocnia Remontowa Nauta Shipyard in Gdynia. Renamed to 'Diamantis'. Sold for demolition to Pakistani buyers J.K. Brothers (Pak) Ltd., in 01.04.1984. 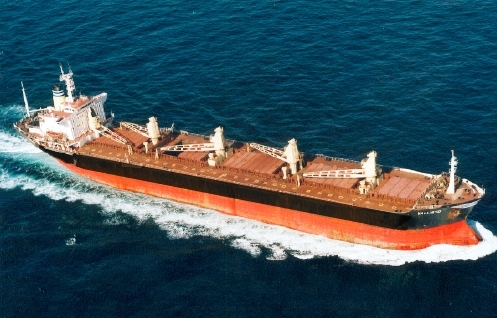 LOA 140.3m, Beam 19.1m, DWT 9,043, Flag Panama, Class Lloyd's Register. Built in 1961 by Palm Line at one of the best shipbuilders in UK, namely, Swan, Hunter & Wigham Richardson Ltd., Newcastle. 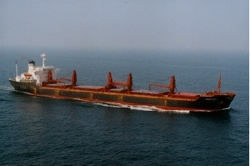 She was named 'Ilesha Palm' and was the flagship of Palm Line. Purchased in 1979 and renamed 'Daphnemar'. 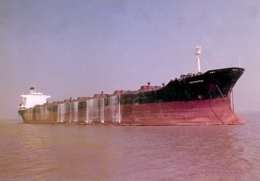 Laid up at Mina Saqr in February of 1982, just over two years later she was towed to Karachi (Gadani beach) for breaking, arriving in the 7th of March 1984. She was broken up by Abbasi Shipbreaking Co.
LOA 150.3m, 19.2m, DWT 10,272, Flag Panama, Class Registro Italiano Navale. Built in 10.1955 at Wilton-Fijenoord, Schiedam yard in Holland. Purchased from Costa Lines in March 1981, renamed to 'Damenham'. Sold to Geofman International for demolition. Broken up at Gadani beach in 2 June 1984. LOA 166m, beam 24m, DWT 23,973. Purchased in 1982 from top Japanese owner Daiichi Chuo Kisen Kaisha Ltd.and renamed 'Joanna P'. One year later installed cargo gear in Piraeus. Sold in 1993 to Chinese buyers for demolition. Broken up at Nantong 31.07.1993. LOA 98.3m, beam 14.6m, DWT 4,622. Built as 'Shinsei Maru' in 1970 at Koyo Mihara Japan. Purchased in 1983 from Greek owners at scrap value in order to remove her gear and install it on the (gearless then) Joanna P. This was a large scale operation at the time and it was the first time that such conversion happened in Greece. The cost was US$ 500,000 which was a huge amount at the time. The vessel was afterwards broken up at Eleusis in 11.1983. LOA 148.5m, Beam 21.4m, DWT 15,447, Class Nippon Kaiji Kyokai. Purchased in 1984, renamed, PLATON CH. Sold 1986 for further trading. LOA 156.2m, Beam 22.7, DWT 18,560, Flag Cyprus, Class American Bureau of Shipping. Built as 'British Wasa' at Hitachi Innoshima, Japan. Completed in September 1969. Purchased secondhand in June 1986 and renamed to Barbara Morgan. Sold for demolition to Chinese buyers in August 1993. 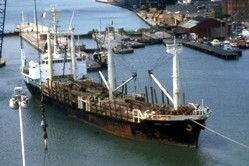 As she was a very good vessel, the Chinese did not scrap her instead kept her for inter Far East trading. They renamed her 'Zhe Hai 720' and' Xing Xing 1'. 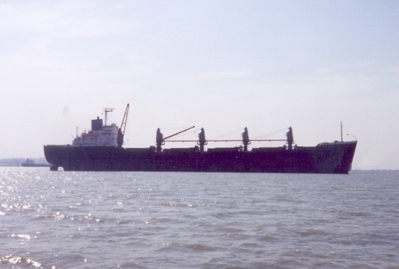 Finally sold again for demolition to Zhong Zin Shipbreaking & Steel and was broken up in 08.08.2003, being 34 years old! LOA 160.1m, Beam 21.9m, DWT 20,641, Flag Cyprus, Class Bureau Veritas. Built 1970 at Giessen-de-Noord, Krimpen a/d Ijssel, Netherlands. She was broken up at Alang in 07.09.1996. LOA 203m, Beam 28.7, DWT 45,316, Flag Panama, Class American Bureau of Shipping. 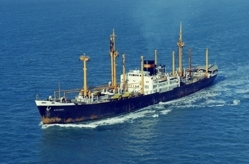 Built 1968 at Mitsui, Tamano, Japan by Konkar Shipping Agencies. Purchased in 1995, renamed 'Ioa'. Sold for demolition to Mahendra Steel Traders, India and was broken up at Alang on 20.08.1997. LOA 259.1m, Beam 32.2m, DWT 77,776, Flag Malta, Class American Bureau of Shipping. 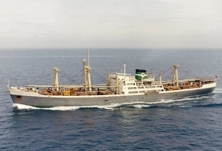 Built 1971 at Mitsui Tamano, Japan by Konkar Shipping Agencies. Purchased 1997. Sold for demolition, for delivery Alang, to Kalthia Shipbreaking Pvt. Ltd. India in 02.02.1998. LOA 167.7m, Beam 22.9m, DWT 27,214, Flag Malta, Class American Bureau of Shipping. Built 1974 at Mitsui Osaka, Japan. Keel laid 15.07.1974, Launched 02.10.1974. Completed 24.12.1974. Purchased 1998. Sold for demolition 02.07.1999, to Arihant Shipbreakers India. Broken up at Alang. LOA 185.5m, Beam 26.1, DWT 33,463, Flag Malta, Class American Bureau of Shipping. Purchased 1998. Sold for further trading in 2002, renamed 'Asian Prime' by new owners. 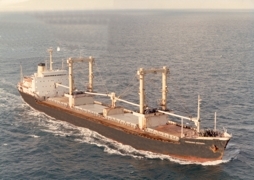 LOA 182.68m, Beam 27.6m, DWT 40,848, Flag Marshall Islands, Class American Bureau of Shipping. Built 12.1979 at Sanoyasu Dockyard, Japan. Sold for further trading in 10.2006. Three more vessels were purchased by our Company but did not make it to the above list, as either they were not delivered, or were resold immediately after purchase. 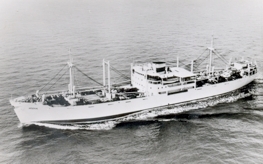 More specifically, in the early 1970s, the Company purchased two vessels from Greek shipowner M. Vettas, the sisters M/V Athina and M/V Nafsika, each of about 6,500 dwt with 4 stroke engines, which were eventually not delivered and for which the sellers paid us damages. 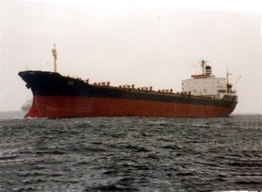 In the 1970s, purchased also M/V Pinelopi from Greek shipowner Eugenides and resold to Mr Miltiadis Marinakis (Vanimar Inc).